Shouts of "Gid-Up" echo along the canal. Pairs of mules strain at their harnesses to get the canal boat moving. The sound of conch shell horns alert locktenders to approaching boats. It is 4 AM, still dark, yet the work day has already begun along the Delaware Canal. The 60-mile-long canal was built to reliably transport anthracite coal from the mines of northeastern Pennsylvania to cities along the eastern seaboard. Opened in 1831, the canal had twenty-four locks (water elevators) that raised or lowered boats on their journeys between Easton and Bristol. The canal shaped communities. Canal boat captains, muletenders, and locktenders made their living on the waterway. Neighboring businesses provided the goods and services canal workers needed while traffic on the canal fueled local enterprise. Powerful speeding trains left canals behind. In 1932, the last coal-laden boat completed its trip on the Delaware Canal. 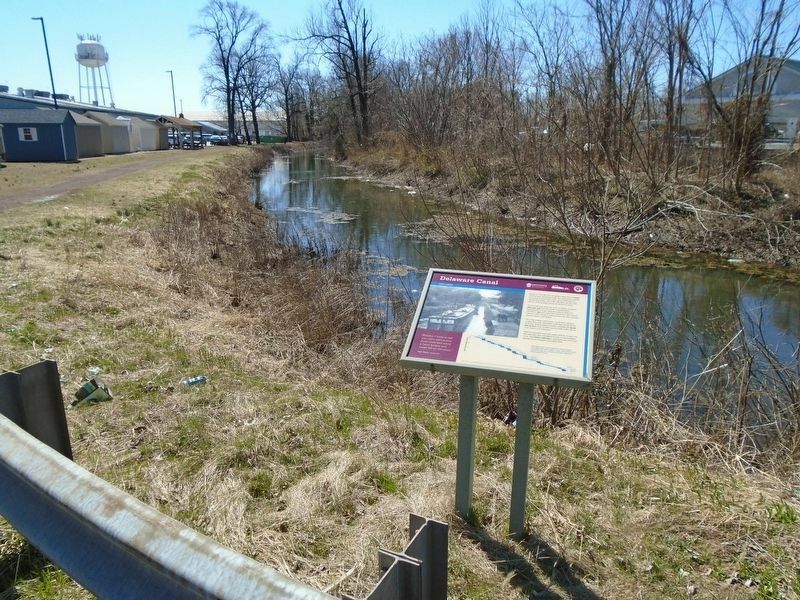 This historic waterway is now preserved for future generations as Delaware Canal State Park. [Photo caption reads] . An empty boat, riding high in the water, heads north for payday and another load of coal. It is passing a heavy coal-laden boat heading south to market. "Besides, I want to tell you there were pretty good times and many a heart broken and rough life on the canal." 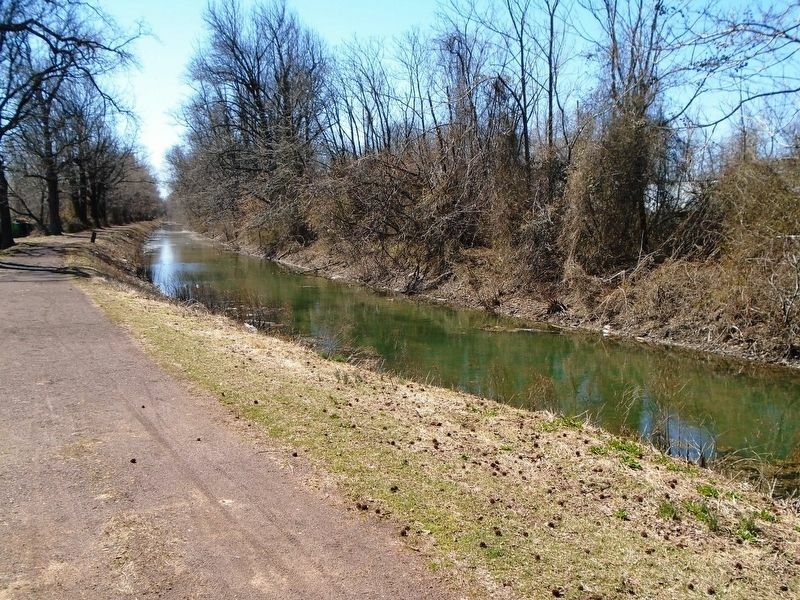 is now preserved for future generations as Delaware Canal State Park. An empty boat, riding high in the water, heads north for payday and another load of coal. It is passing a heavy coal-laden boat heading south to market. This side view of the Delaware Canal shows the locks that were used to raise and lower boats along the 165-foot elevation change between Easton and Bristol. 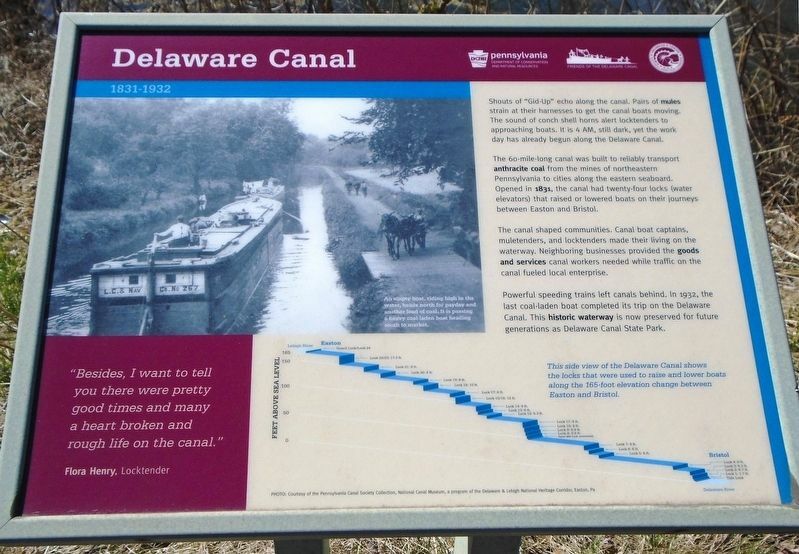 Erected by Delaware & Lehigh National Heritage Corridor, Friends of the Delaware Canal, and the PA DCNR. Location. 40° 7.071′ N, 74° 50.61′ W. Marker is in Bristol, Pennsylvania, in Bucks County. Marker is on Green Lane south of Bristol Pike (U.S. 13), on the right when traveling south. Touch for map. Marker is at or near this postal address: 498 Green Lane, Bristol PA 19007, United States of America. Touch for directions. (approx. 1½ miles away); Marker 19T (approx. 1.6 miles away); Lock No. 2 (approx. 1.6 miles away). Touch for a list and map of all markers in Bristol. Credits. This page was last revised on March 25, 2019. This page originally submitted on March 25, 2019, by William Fischer, Jr. of Scranton, Pennsylvania. This page has been viewed 78 times since then. Photos: 1, 2, 3. submitted on March 25, 2019, by William Fischer, Jr. of Scranton, Pennsylvania.